Compiling can be initiated either by passing a resource script file as a parameter on the the command line (see below), or by using Resource Hacker's text editor. Supported compiler directives include: #DEFINE, #UNDEF, #IF, #ELIF, #ELSE, #IFDEF, #IFNDEF, #INCLUDE, and #PRAGMA. The #INCLUDE, #IF, and #IFDEF directives can all be nested to multiple levels. , \\ , \" , and \000 .. \377 (octal). A double-quote within a string can be 'escaped' by preceding it with either a backslash or with another double-quote character. Script comments are preceded either by double forward-slashes (//) or by a semi-colon (;). Filenames in within resource statements can only be parsed as strings, so they MUST be enclosed within double-quote characters otherwise compile errors will be raised. A complete list of Resource-Definition Statements can be found here. 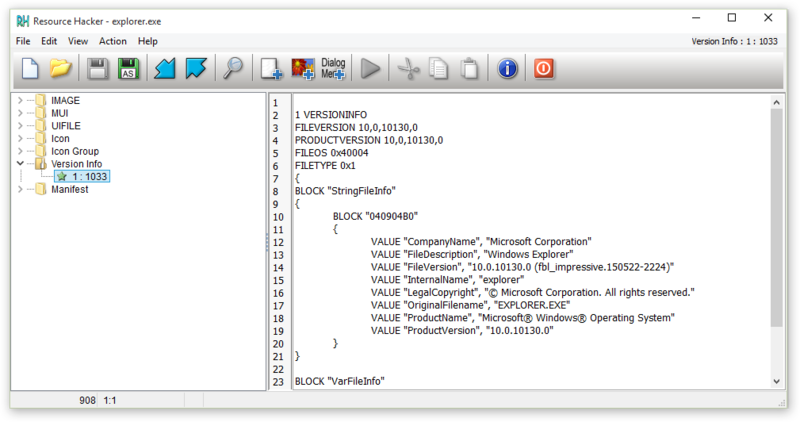 However, some resource types will be displayed in both its compiled form (eg dialog or popup menu) and in its decompiled text format. 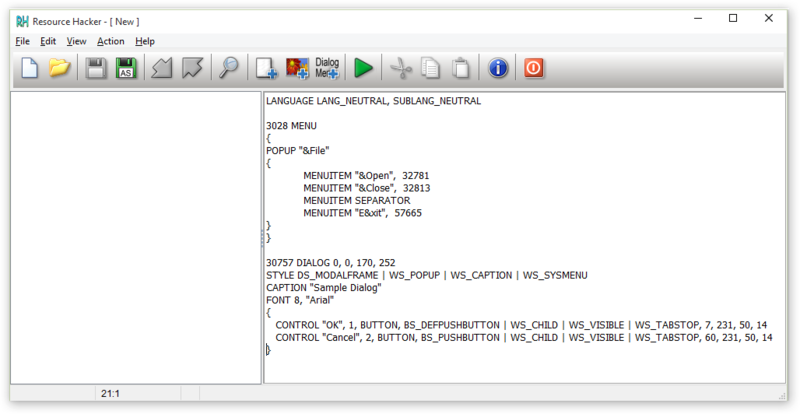 Dialog, menu, string-table, message-table, accelerators and Borland form resources can all be easily edited and recompiled using the internal resource editor. 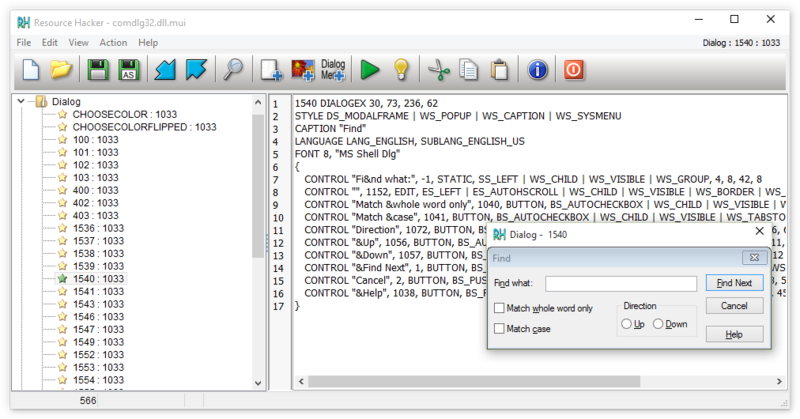 Dialog controls can be visually resized and/or moved, with any changes being reflected in the resource script automatically. Conversion between screen pixels and dialog units is done automatically. Select a control by clicking it in the displayed dialog. 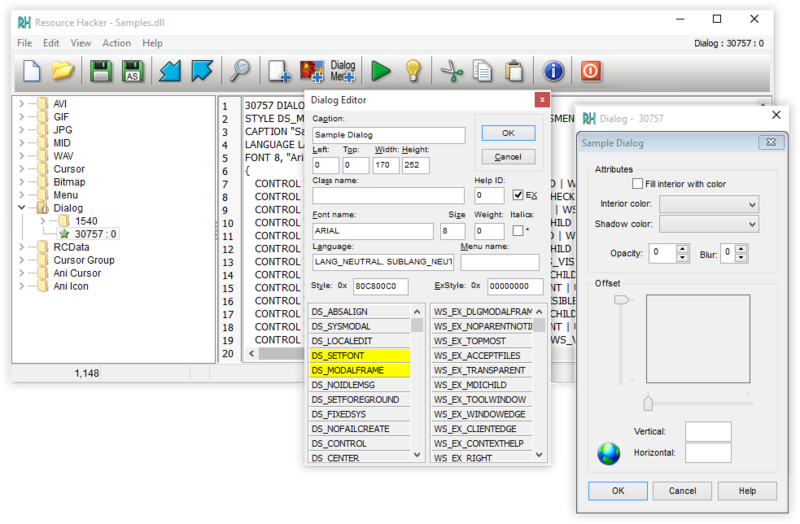 Alternatively, the Tab or Shift-Tab keys can be used to select next or prior controls respectively. The selected control will show resizing handles. To move a control without resizing, once the control has been selected, click and drag it to its new location. The arrow keys can also be used to move a control once it has been selected. 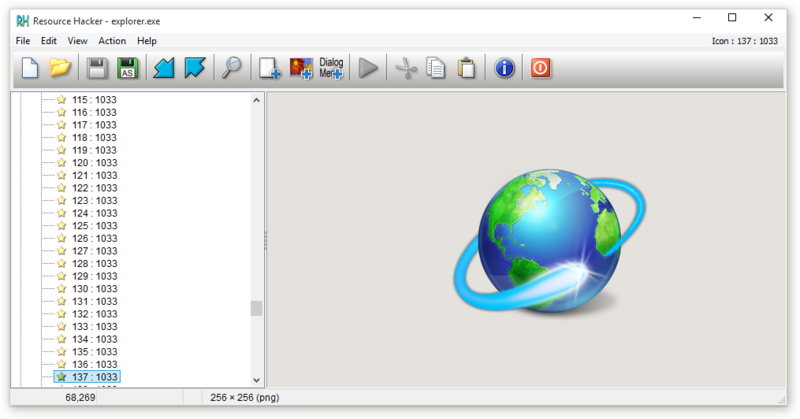 A control can be resized by clicking and dragging one of its resizing handles. Alternatively, the arrow keys combined with the shift key can be used to resize a control. 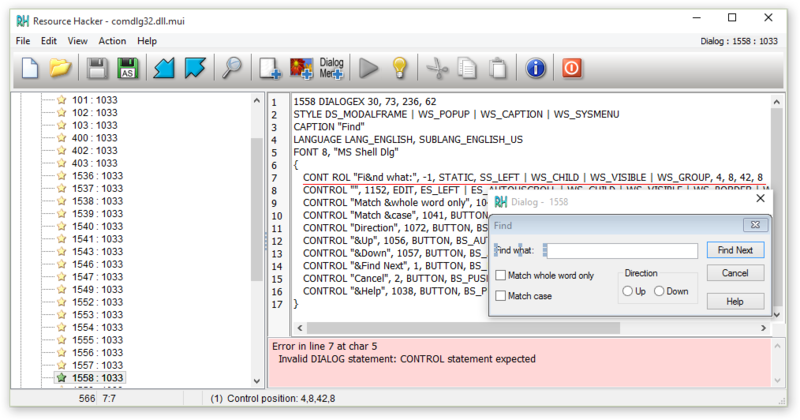 The Dialog Editor can be opened from the popup menu which is displayed by right-clicking the preview dialog. 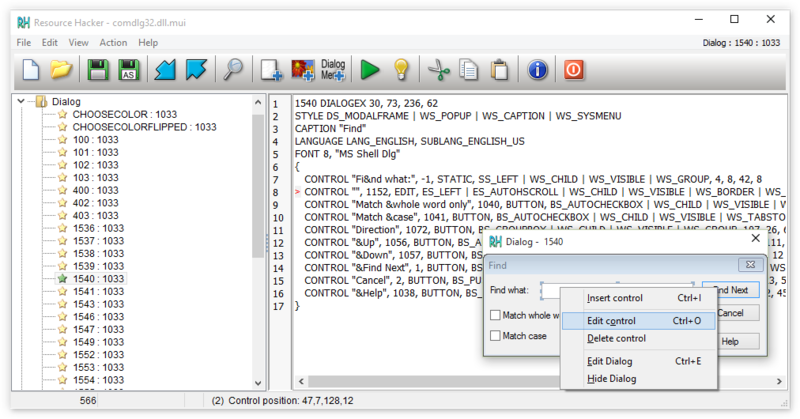 The Control Editor can be opened from the same menu once a control has been selected. New controls can also be added. 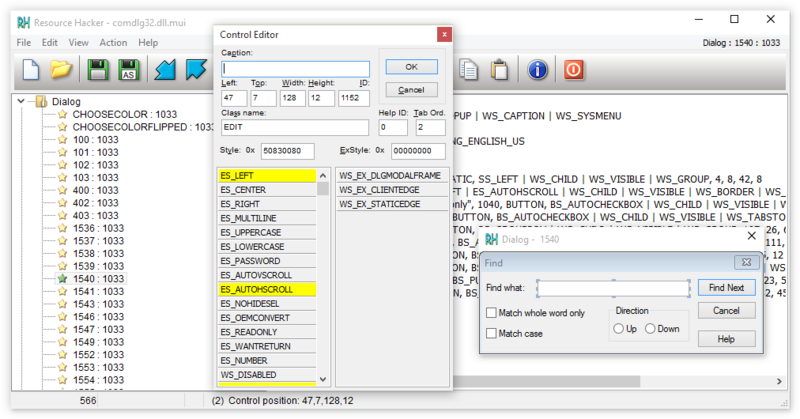 The Control Editor supports almost all of Microsoft’s standard and common control classes. User defined custom classes can also be added to the predefined list of classes by carefully editing the “Dialog.def” text file which can be found in the same folder as Resource Hacker™. Toolbar buttons enable selection of the most commonly used controls. The top-left corner of the control to be added will default to the point at which the dialog was originally right-clicked. 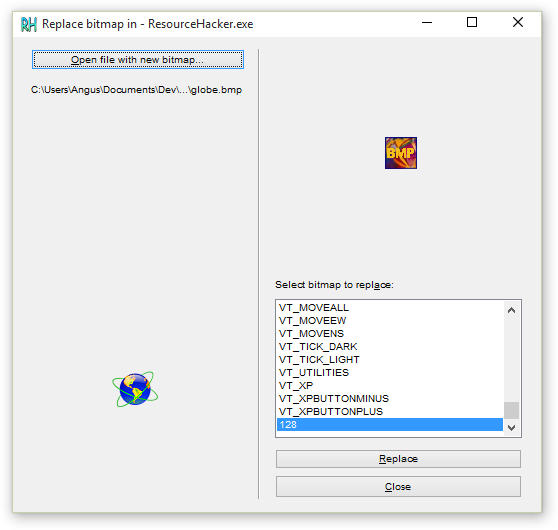 If the resource item to be replaced is an icon, cursor, or bitmap, the source can be an *.ico, *.cur or *.bmp file respectively or selected from a *.res or another *.exe file. Select Action|Replace Icon (Cursor or Bitmap) from the menu. Just about all the functionality of Resource Hacker™ can be accessed from the command line without having to open the Resource Hacker™ GUI. Command line instructions and Resource Hacker™ scripts can remove the drudgery entailed with repeating Resource Hacker™ tasks. -resource filename - contains a resource being added to the opened file. -help options - commandline or script (always logged to CONSOLE) other switches are ignored. Switch identifiers (except -script) may be abbreviated down to a single char (eg -res or -r). Switch instructions do not have to be in any particular order. File names that contain spaces must be enclosed within double quotes. @pause :: so we can see the console output before the CMD window closes. Note: Filenames that include spaces must be enclosed within double quotes. This software is not to be distributed via any website domain or any other media without the prior written approval of the copyright owner. DISCLAIMER: A user of this Resource HackerTM software acknowledges that he or she is receiving this software on an "as is" basis and the user is not relying on the accuracy or functionality of the software for any purpose. The user further acknowledges that any use of this software will be at the user's own risk and the copyright owner accepts no responsibility whatsoever arising from the use or application of the software. The above licence terms constitute "copyright management information" within the meaning of Section 1202 of Title 17 of the United States Code and must not be altered or removed from the licensed works. Their alteration or removal from the licensed works, and the distribution of licensed works without all the above licence terms in an unaltered way, may contravene Section 1202 and give rise civil and/or criminal consequences. Some executable files are "packed" or "compressed" using compression algorithms after they have been compiled. While this reduces the size of these files, it also makes it more difficult to view and modify resources. While it's possilbe to reverse any compression and still view and modify resources, I've decided not to do that on the assumption that that would be disrespecting the intentions of the file authors. 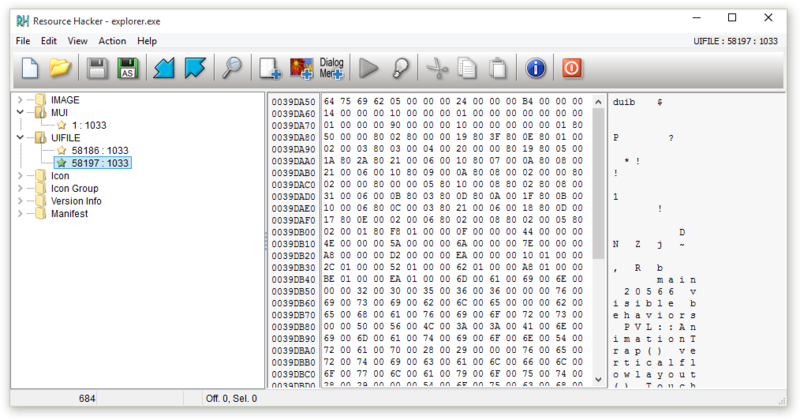 When a "compressed" executable is opened with Resource HackerTM only the types and names of resource will be visible. 944 3,116 Angus Johnson <img src="https://www.oldergeeks.com/downloads/gallery/thumbs/Resource Hacker1_th.png"border="0"> Jan 04, 2019 - 11:03 5.1.7 2.96MB ZIP , out of 18 Votes.